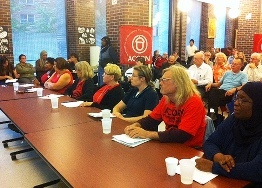 Ottawa ACORN members hosted a Social Assistance Forum Sept 15 and invited candidates in the provincial election to answer hard hitting questions around the rates of social assistance, special diet, child poverty, affordable housing and more. 120 community members attended and as well as a number of local media outlets. Representatives from the New Democrats, Liberals, Green Party, People's for Special Needs Party and others participated. All parties were invited so members and the community could hear their views before casting their vote on election day. "We did a good event, but politicians need to be held accountable for the promises they make. Politicians are politicians, but we need to make sure they remember who elected them." OTTAWA — A lone wolf who has been fighting the Ontario government on his own over claims of discrimination now has an ally. 'Crazy' Dave Thomasson believes his rights — and those of thousands more — are being violated by the Ontario Disability Support Program (ODSP). But his efforts to have ODSP regulations changed in court were foiled by the provincial government. Now Thomasson has plunked down $10 to join ACORN Ottawa, which organized a lobbying effort this week to influence the province's social assistance review commission. "ACORN strongly supports and agrees with my position with the ODSP, and they are willing to bring it to the public in Ottawa (at the commission's hearings)," Thomasson said. ACORN converted the gist of Thomasson's claims onto a flyer, which is being distributed to participants at the hearings. In the flyer, ACORN has adopted Thomasson's challenge to the provincial government: "Prove Me Wrong, McGuinty Can't" which is accompanied by a $1,000 prize for anyone who proves the ODSP complies with the Canadian Charter of Rights and Freedoms. It's been 1,640 days since Thomasson issued his challenge. March 14th, 2011 - Today, members of Ottawa ACORN are extending their warmest gratitude to the Ontario Public Service Employees Union (OPSEU) for their continued support. Dave Lundy, a regional Vice-President at OPSEU joined members Wayne Mahoney and Anthony Dipoce at the Ottawa ACORN office and presented a cheque for $5000.00 to support continue organizing in the city. Ottawa ACORN members are looking forward to working with OPSEU throughout 2011 as their Living Wage Campaign comes before City Council and other initiatives continue to progress. Labour-Community alliances like the one between OPSEU and Ottawa ACORN allow working families in and out of unions to collaborate on issues and campaigns of mutual concern. Extra cash for chronically ill welfare recipients to eat healthy will be harder to get starting April 1 under new rules designed to combat fraud and comply with an Ontario Human Rights Tribunal ruling -- changes that are making some sick people nervous. "We really do not want to disadvantage people who need the special diet allowance, people who are ill and who need that extra money to live with their illness or condition," Rebecca MacKenzie, a spokesman for Community and Social Services Minister Madeleine Meilleur said. "At the same time, fraud is unacceptable," she said. "Fraud that happens hurts everyone else who is in the program for the correct reasons." As of April, recipients of the special diet allowance will all have to reapply for the program, consent to have their relevant medical records checked and have their applications signed by a doctor or registered nurse practitioner, nutritionist or midwife. As well, there are changes to the rates people with different conditions would be paid, with some afflictions getting less money or delisted altogether. Those changes were the result of the human rights case in which patients with conditions such as diabetes or obesity that did not qualify for the program sued. The tribunal ruled in their favour so the province set up a panel of medical experts to recommend which conditions would qualify. MacKenzie said while people with some conditions may qualify for less money, many will qualify for more. But Edward Lantz is nervous. EMC News - Friends and volunteers of the Ottawa Association of Community Organizations for Reform Now took to the streets on Valentine's Day to convince the provincial government to improve social assistance. The protest at 351 Preston St. is the start of ACORN's 10 week campaign to increase social assistance rates, maintain special diet allowances, improve medical coverage, stop clawbacks in support, and support housing benefits. To get the message across, ACORN will be releasing a story per week of the hardships faced by those living off of the Ontario Works or Ontario Disability Support Program. "We're taking ten people's stories of people receiving provincial assistance," said Kathleen Fortin, chair of Mechanicsville/Hintonburg ACORN and recipient of ODSP. "The amount that people are getting on assistance is not meeting their needs." According to a release from ACORN, "many families spend most of their assistance benefits just to cover their rent and this is driving people into abject poverty. To bring the rates back up to pre-1995 levels adjusted for inflation would require a 50 per cent increase." The protest had 26 members present. The group put together a Valentine's card to send to the McGuinty government, telling the provincial government to "have a heart." "The thing we're complaining about, is when Mike Harris was in power, he significantly cut social programs," said Fortin. Low-income families throughout Ottawa won't have to worry about losing a portion of their tax return to processing fees this tax season. The Ottawa chapter of the Association of Community Organizations for Reform Now [Canada] (ACORN Canada) is providing free tax return service for the less privileged in the community. The program is made possible through the efforts of volunteers like Keisha Lim, a fourth-year economics student at the University of Ottawa who is also serving as the tax clinic coordinator. "On average, we save people around $80 by doing their taxes here," said Lim. "This is the third year that ACORN has been running the tax service. We have done 1,266 tax returns the last two years, and 244 for back taxes. We've put back $1.6 million into the neighbourhood through those savings." This is the third year the program has been serving the community, and has done roughly 600 returns per year. "We're here to help people," said Lim. "Instead of putting money in the pockets of corporations, we're letting people keep that money themselves." The program has helped people from all over the Ottawa area, from places as far away as North Grenville, Kanata, and Orleans.